The Lottery Ticket sales are going well and we are getting close to selling all 1,000 tickets. If you have not purchased (or sold) your tickets, get them now!! 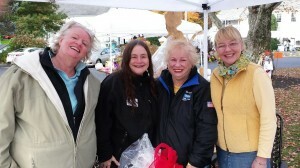 We did really well selling tickets at the recent Harvest Festival on October 18 on the Sturbridge Common. During the Festival we set up our booth in front of the Publick House with the scarecrows. 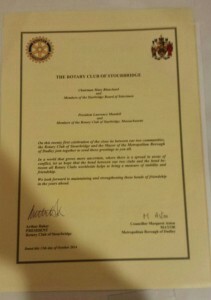 Another first for Sturbridge! We celebrated the Annual Sturbridge / Stourbridge Friendship Day with a pre-recorded Skype “live” exchange. President Larry read the Proclamation from the Board of Selectmen of Sturbridge during the formal greetings. 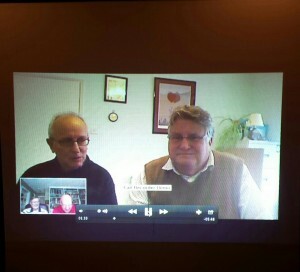 Stourbridge President Arthur Baker is pictured on the left in the photo below with John Savage serving as the Skype guru. At the bottom of the photo, you will see our Skype guru, Klaus Hachfeld with President Larry. 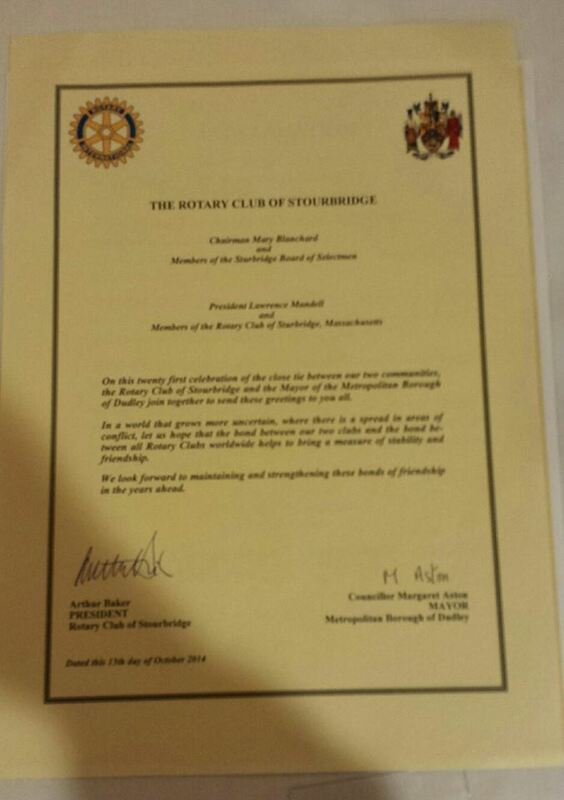 Also pictured is our Letter of Friendship from Stourbridge. We have extended an invitation to our Sister Club to visit us in 2015 so we are anxious for their response. 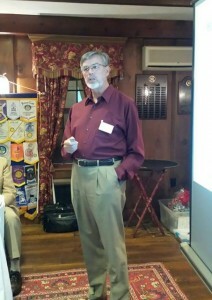 PDG and PP Klaus Hachfeld gave the Club a very enlightening look into how the Rotary Foundation works. The Rotary International Foundation has a program of matching grants that are available to Clubs working on special projects. Klaus outlined some of our global projects with help from other District Clubs, plus donations and support from our Sister Club in Stourbridge, England. 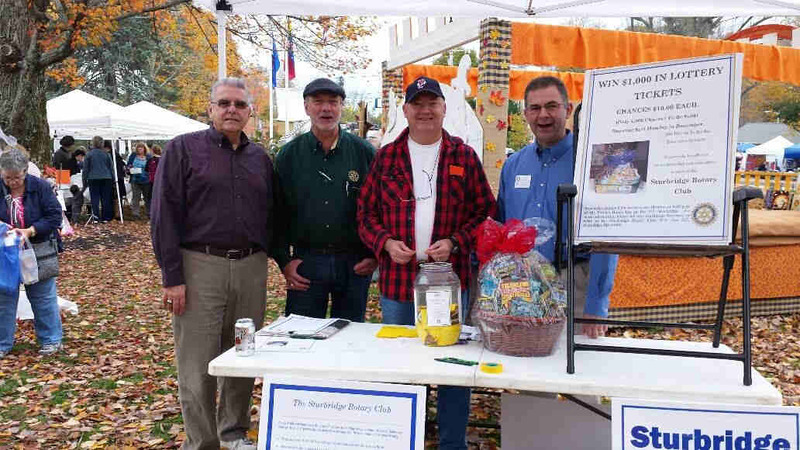 Sturbridge is a small Club but part of a large organization. We this help, Sturbridge has been able to supply a hospital with maternity beds and help a school in Uganda; dig deep wells in Africa; provide a full optometry clinic in Peru with a value of $400,000; new surgical tools for hand surgery in Kosovo with the help of the National Guard flying the equipment and delivering it directly to the Clinic (value of surgical tools $78,000) cost of flight and delivery $000…and so much more. 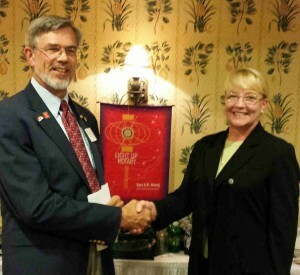 Our PDG Klaus is an extremely valuable member and a walking Rotary encyclopedia. And this does not begin to list everything that we do as our local projects. All of this is another indication of good people doing great things! The Sturbridge Rotary Club is pleased to welcome Ingrid Swift into its organization. Rotarians Klaus Hachfeld, Bill Lemke and Rotary Club President Larry Mandell presided over the induction ceremony on Monday evening. 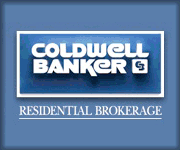 Ingrid of Fiskdale is an Executive Recruiter specializing in the nonprofit sector as well as a real estate agent in the local area. We are excited to have Ingrid on board as our Club continues to grow. Shown with Ingrid is Past District Governor and Past President, Klaus Hachfeld. The three area sophomore students who represented our Club at the Rotary Youth Leadership Award (RYLA) program were invited to return to our meeting this week to share their experiences with us. Unfortunately the student from Shepherd Hill could not attend our meeting. About 200 teens from different schools and towns met for the first time at RYLA and quickly learned to work and have fun together. The entire 3-days were filled with workshops of presenting problems, possibilities and obstacles. It was obvious that the students had an incredible time. They are looking forward to being at the function next year as volunteers to help the new teams. 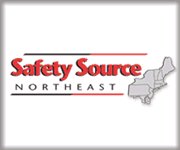 The two students from Tantasqua are shown below. 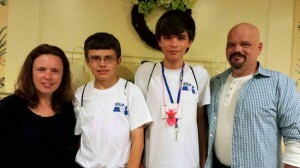 Left to right is Karen Rothweiler with her son Justin and Jason with his father, Bill DeForge.